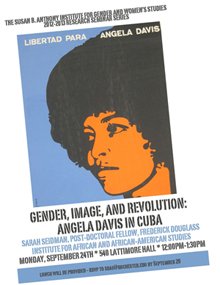 Dr. Sarah Seidman will share her current research project on Angela Davis's time in Cuba. She recently completed her dissertation, Venceremos Means We Shall Overcome: The African American Freedom Struggle and the Cuban Revolution, 1959-1979, exploring transnational convergences between the African American liberation movement and the Cuban Revolution in the 1960s and 1970s. Lunch will be provided - please RSVP to sbai@rochester.edu by Thursday, September 20.